What's the proper way to load a dishwasher? How do I know what can be washed in a dishwasher? Which detergent type is better - liquid gel or powder? My dishwasher takes too long. What's wrong? There's always water at the bottom of my dishwasher. Why isn't it draining completely? My cups and glasses are coming out spotty, cloudy and filmy. What's wrong? 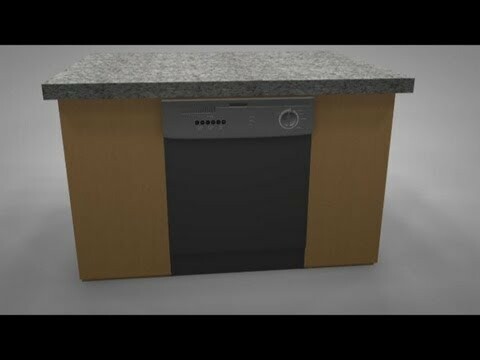 The dishwasher is one of the most appreciated home appliances. In addition to simplifying the chore of cleaning dishware and utensils, it uses considerably less water than if the dishes were washed by hand. Periodically use a warm rag and some household cleaner to wipe the space between the door and bottom of the tub. Food particles often collect here and lead to mold growth, as this location remains untouched during the wash cycle. Use a pipe cleaner or sewing needle to remove food particles, bits of paper or other debris from the spray arms' small holes. Never use a toothpick, as the tip can break off inside of the wash arm. A deodorizer specifically designed for dishwashers makes it easy to prevent mold growth and keep the interior smelling fresh. A rust-removing solution designed for dishwashers will eliminate rust stains. You can clean the door (exterior) with warm water and a small amount of dish detergent. Your dishwasher may have a filter located near the bottom or under the lower spray arm. This filter should be inspected and cleaned regularly. Follow your dishwasher owner's manual for specific instructions about how to properly remove and clean this filter, if equipped. If there are any holes or other damage to the filter, you'll need to replace it immediately to protect the dishwasher's pump and motor seals from damage. If the plastic coating wears off of your dishwasher's top or bottom rack, repair as soon as possible. Use replacement tine tips, which are available in an array of colors to match your unit's racks. Use touch-up paint to cover flaking paint. If left alone to rust, the racks may corrode, allowing small shards of rusty metal to enter your dishwasher's pump, leading to expensive repairs. Enter your dishwasher model number in our search field to find replacement tine tips, touch-up paint and many other parts for your model. Cramming two loads into one load will restrict the water spray patterns, which will prevent proper cleaning and require you to have to rewash, wasting water. Enter your dishwasher's model number in the Repair Help section of our website to get specific repair tips for your model. RepairClinic has replacement parts for dishwashers including dish racks, rollers, spinners, water inlet valves, gaskets, pumps and more. Enter your dishwasher's model number for a list of parts recommended for your dishwasher. Manufacturers advise that cutlery be loaded with the "business" end facing up, a.k.a. the end that touches food. The reason? Better water circulation. Facing the business-end down in the basket restricts water flow. However, sharp knives and utensils should always face down to help prevent injury when unloading the dishwasher. Care should be taken, of course, when removing these utensils from the basket. Dishes and cookware should have exposed surfaces facing the spray arms. Knives and other cutlery with wooden handles are best washed by hand because over time, detergent can cause wood to become brittle and crack. Plates, leaning toward the center near the spray arm. Make sure the surface is exposed! Cutting boards should be placed on the outer-most part of the rack. Plastic, glassware, mugs and cups. Make sure to leave space between them so that there's no fear of breakage. 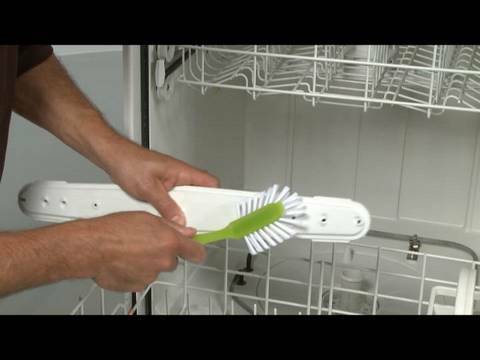 Long utensils and knives may block the spray arm in the lower rack so it's best to rest them flat in the upper rack. RepairClinic has dishwasher accessories and parts including recommended replacement parts. Have your model number handy. Look for a dishwasher-safe imprint before you place items into your dishwasher. Pay particular attention to plastic food storage containers, which can melt if they come into contact with the heating element at the bottom of the dishwasher. If you're not sure, put them in the top rack only or wash them by hand. If a piece of plastic melts to the heating element, it can be tough to remove it. We recommend the powdered/granular detergents (i.e. Cascade®). In recent years, we've found the pod-like, powder detergent-filled, dissolving packets to work well because they reduce likelihood of using too much detergent. We've also found that prominent brands perform better than generic brands. It may be a model that pre-heats the water. If so, and if the water entering the dishwasher is cool, the heater may take up to half an hour to heat the water. To avoid the wait, increase the incoming water temperature before turning on the dishwasher. Do that by running the kitchen sink faucet until the water runs hot. Or increase the temperature of the hot water to the entire house at the hot water heater. Warning! To lessen the risk of scalding, don't set the hot water heater temperature higher than 120 degrees Fahrenheit (48 Celsius). All dishwashers leave a small amount of water at the bottom in order to keep the seals and pump moist. The pump and seals may become brittle and lead to leaks and expensive repairs if left to dry out completely. For spotting only, try using the heated drying cycle. If that doesn't help, try using a rinse-aid product. Excessive detergent usage: Etching, or cloudiness, is glass corrosion. It is often caused by using too much detergent. A rainbow hue is the first sign of etching. Cut in half the amount of detergent used. There could be a water flow restriction. Enter your dishwasher's model number in our Repair Help for additional information. You may have hard water. You can purchase water hardness testing kits at home improvement stores to determine if a water softener is needed for your water supply.